I’m about as big a fan of markets you will find from someone on the center-left (a very imprecise designation). I prefer the government allow free interaction between people as much as possible unless the negative externalities outweigh the positive consequences of the exchange. But certain recessions seem to call out for intervention. We don’t have jobs because businesses aren’t hiring. Businesses aren’t hiring because they don’t have sales. Businesses don’t have sales because people don’t have money. People don’t have money because they don’t have jobs. He believes in these situations the government needs to step in to break that cycle by boosting aggregate demand and putting people to work. For those who don’t favor fiscal or monetary stimulus, what is supposed to break that cycle? Falling prices don’t seem to do it. First deflationary cycles can happen and those are very dangerous. Also “sticky wages” won’t allow businesses to cut nominal wages enough for the market to easily self adjust. Economists George Akerlof and Robert Shiller in Animal Spirits discuss the topic. Yale’s Truman Bewley gives qualitative evidence on money wage stickiness. He conducted an intensive interview study of New Englanders involved in the wage setting process. He asked why money wages had not declined in the New England recession of 1991-92. With the high unemployment of the time, any worker who might quit in response to a wage cut could have been replaced easily and rapidly. But Bewley found that employers were loath to reduce wages during the recession. In the employers’ opinion workers would view such wage cuts as unfair. They would reduce their commitment to their jobs. Furthermore, when the economy revived they would still be angry and thus more likely to quit. Bewley found a few firms that made such cuts, but only after considerable agonizing and also after continued losses. In those rare instances workers accepted wage cuts as fair. They were a last resort, necessary to save their jobs. It might be an irrational feature of human nature that causes that but it exists and can’t be wished away to fit an ideological commitment to free markets. I suppose one could argue that after the economy completely crashes with prolonged periods of high unemployment which causes huge amounts of human suffering, economic loss, and lost opportunity the economy might eventually self-correct. That might be a necessary evil if it prevented all future recessions, but it obviously wouldn’t. What is supposed to break that cycle? Are you conceding that a devastating depression is necessary for the market to realign? If so, why is your commitment to markets stronger than it is to people? 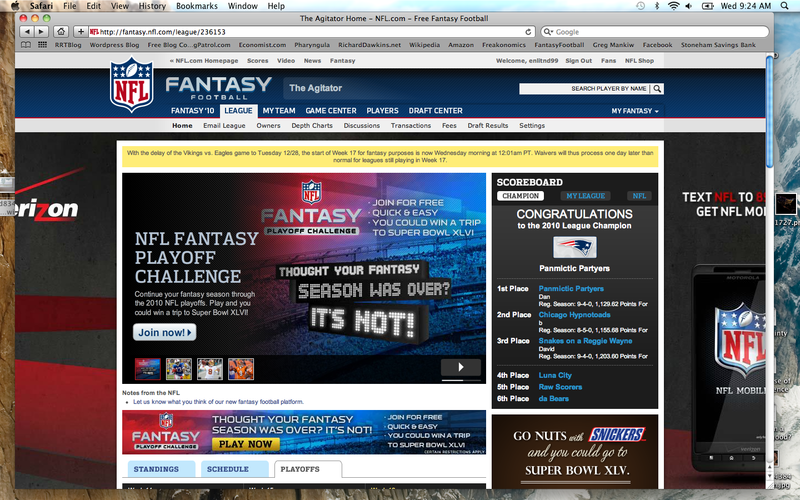 I won Radley Balko’s Fantasy Football league this year! My team was the Panmictic Partyers. Now if the New England Patriots can prepare as much as I did they should easily duplicate my feat and win it all. Oh, and I’m happy Tucker Carlson didn’t get his way or I would have never won. Criminalizing marijuana, criminalizing the possession of a few ounces of pot and that kind of thing, I mean it’s costing us a fortune and it’s ruining young people. All of the Senate Democrats have signed onto a letter expressing their support for reforming the filibuster. This is great news. The filibuster isn’t a noble refuge for a principled Senator as glamorized in Mr. Smith goes to Washington; it is a devise of minority obstruction that prevents the legislature from legislating and undermines the system the Founding Fathers actually set up. Right now the electorate can’t actually judge the majority party on the policies they favor. Ezra Klein’s March Newweek piece remains one of the better recent cases against the filibuster. [R]ecall that the filibuster is an accident, and there is nothing radical or strange about majority voting: we use it for elections (Scott Brown won with 51 percent of the vote, not 60 percent), Supreme Court decisions, and the House of Representatives. As for a majority using its power unwisely, elections can remedy that. And voters can better judge Washington based on what it has done than on what it has been obstructed from doing. Say you’re a conservative and you want to repeal healthcare reform, privatize social security, simplify the tax code, or pass whatever else your heart desires, now imagine that in 2012 you keep control of the House, take over the Senate and end up with 59 Senators, win the presidency, and all those policy wishes are polling extremely favorably with the American public, which just completely repudiated the Democrats. Guess what? You can’t do any of it if the Democrats commit to a filibuster. And if the filibuster trend continues this seems like it will become a routine scenario. In interest of fairness and bipartisanship here is the absolute best case against reforming the Senate rules that Matthew Yglesias wrote sometime early last April. Obviously, even to this day nobody would think of drinking coffee without first deploying their cooling saucer. That’s why every office in America has, in its kitchen, not only a coffee machine but also an accompanying cooling saucer. Visit your local Starbucks and ask about their cooling saucer. Now try to imagine the nightmare of coffee poured directly from the machine into the cup—that’d be your Senate-less America, a grim and scalding place. New Atheists Hurting Science Literacy? It’s a common critique made of “the New Atheists” that they harm their own cause of science literacy by so harshly attacking the religion that supports inaccurate beliefs about the world. These critics (e.g. here and here) argue that we shouldn’t attack religion but rather should frame science in a way that seems more compatible with faith. Despite that this is what the scientific community has been trying to do for decades with no apparent success, any deviation from the status quo is presumed to be automatically counterproductive. The New Atheist movement, if one insists on calling it that, started around 2004 with Sam Harris’s The End of Faith and propelled to increasing popularity with Richard Dawkins’ The God Delusion in 2006. So let’s check to see if the popularity of their approach had any obvious negative effects on the acceptance of evolution like critics like Robert Wright and Chris Mooney assume. Now it is possible that the upward trend in acceptance would be higher or the drop in hard creationism would be steeper had Dawkins and Coyne never written their books, but it is clear that there isn’t any positive evidence that the New Atheism is harming the cause of science. The reality of course is that this movement’s effect on science literacy is likely extremely minor. For critics to insist that atheists shut up because they are harming science is ridiculous. This video manages to wrap together 3 pretty disturbing things: Unquestioning allegiance to authority, contrived and zealous religiosity, and children singing.